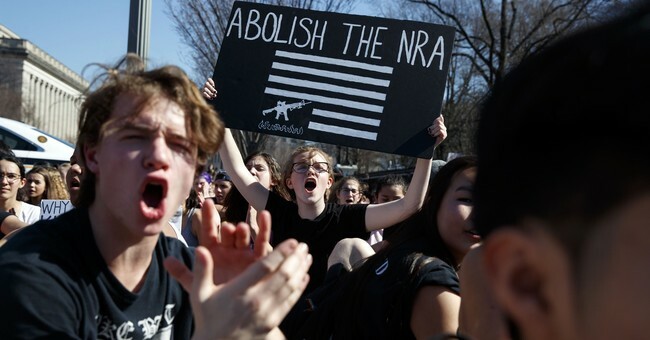 On Wednesday, thousands of students across America participated in a national school walkout to agitate for gun control one month after the mass shooting at Stoneman Douglas High School in Florida. While many of the protestors from more than 3,000 separate events are staying on their school campuses to protest, some have marched on their local statehouses and even Capitol Hill itself to demand new gun control laws. Prominent Democratic politicians like Sen. Chris Murphy (CT), Sen. Richard Blumenthal (CT), Sen. Bernie Sanders (VT), Rep. Luis Gutierrez (IL), and others walked out of the Capitol building to personally speak to and laud the student activists for their efforts. In spite of their public façade of being anti-violence, the Women’s March has a troubling history of honoring cop killers and murderers both on social media and at their official events. Throughout is existence, the BLA framed its violent attacks on police as a legitimate response to the forces of colonial occupation in the nation’s ghettos. As Shakur declared, “[o]ur backs are against the wall [and] now more than ever we need an army to defend ourselves and fight for our liberation.” During the next three years, the BLA wounded or murdered policemen in New York, New Haven, Philadelphia, Atlanta and St. Louis. The BLA’s area of operations extended as far as San Francisco. In August 1971, members carried out a string of bank robberies, attempted to murder a policeman, and mounted a nine-person attack on a precinct house that left a police officer dead. On May 2, 1973, as two New Jersey state troopers stopped her car for traffic violations, Shakur put her words into action. Along with two accomplices who were with her, Shakur opened fire on the two cops. In the resulting shootout, one trooper was killed when he was shot in the back of the head with his own service revolver. The second officer was wounded, but managed to survive the encounter. One of Shakur’s compatriots was killed as well, while the other remains in jail to this day. After her conviction for murdering the trooper (among other offenses, including armed robbery) in 1977, Shakur was sentenced to a life term, but she escaped from prison in 1979. At some point in the early 1980s, she made her way to communist Cuba as a “political refugee.” In 2013, the FBI put out a million dollar reward for information leading to Shakur’s arrest. She remains on the agency’s infamous “Most Wanted” terrorist list and holds the dubious distinction of being the first woman placed on it. What a role model for the youth of America. However, instead of leaving it at just kidnapping, the group ended up torturing the 62 year-old man to death. Over a period of 15-20 days, Vigliarole was starved, beaten, burned, crushed, sodomized with a three-foot metal pole, and ultimately suffocated to death before being stuffed in a trunk and left to rot. Hylton and her partners in crime were caught by the police after she personally delivered a ransom note for Vigliarole to one of his friends, who took down a partial license plate of her car. Hylton only served 25 years in prison for her gruesome crimes. Before pretending to care about victims of gun violence, maybe the Women’s March should be held to account for its repeated promotion of murderers and violent gun criminals and terrorists first.